Mark ordered clams at the seafood restaurant. It's no good trying to get a clam like him to talk. This watch cost me a hundred clams. There were people clamming on the shore. In UK English, a clam can also be an instrument for clasping things together. It may be a clamp, vice, or a pair of pincers, depending on which industry the term is used in. The adjective clammy has nothing to do with shellfish. It means sticky and moist, like your palms when they get sweaty. You can also use it about the weather, to mean that it is humid. This adjective comes from the unrelated verb to clam, meaning ‘to smear or daub’ with something sticky, ‘to clog,’ or ‘to be moist and sticky.’ These verb senses are now rare, but the adjective is still in common usage. Clam, meaning ‘pincers or clamps’ dates back to before the year 1000. The Old English noun clamm, originally meaning ‘fetter, bond, grip or grasp,’ can be traced back to the Proto-Germaic root klamm– (to pinch or squeeze together) and the Proto-Indo-European root glem– or glom– (to contain or embrace). It is related to the Old High German klamma (cramp, fetter or constriction) and the German Klamm (a constriction), as well as English words such as globe, glebe, clasp and clip. The sense ‘pincers or clamps’ appeared sometime in the 14th century. 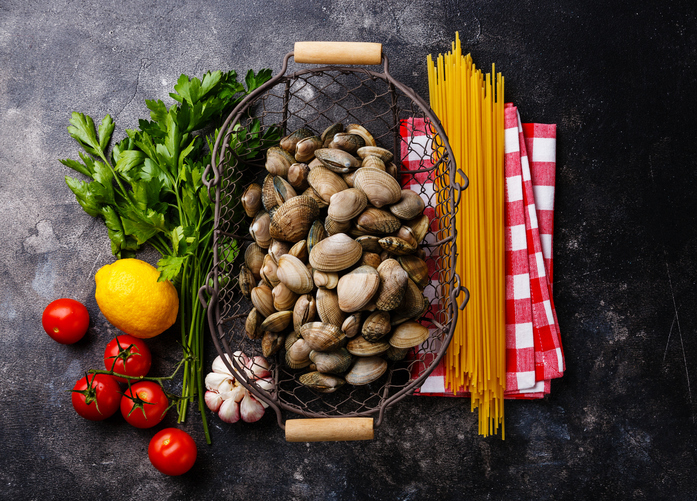 Clam, meaning the mollusk, is a shortened form of clam-shell, and was first used in Scotland the late 16th century (clam-shell itself is recorded from around the year 1500). It emerged as a figurative use of the ‘pincers’ sense. The verb comes from the noun and, meaning ‘to dig for clams,’ dates back to the early 17th century, in American English. The verbal phrase clam up (meaning ‘be quiet’) was first used in the US in the early 20th century, but clam had been used as an interjection with the same sense since the mid-14th century.